He thought someone was actually in distress. Alfred Norwood Jr. panicked when he saw the man dangling from the roof. He had just driven his wife to work in Austin, Texas, and on his way back, he saw a man hanging from the roof of a two-story house, apparently holding on for dear life. Norwood, 65, desperately tried to move the ladder so the man could get a foothold. Norwood, an Air Force veteran, tried to flag down help from passing cars but he didn’t have luck, so he called 911. While he was waiting for the police to arrive, he took a closer look at the man in distress — and realized it wasn’t a man at all, but a dummy. 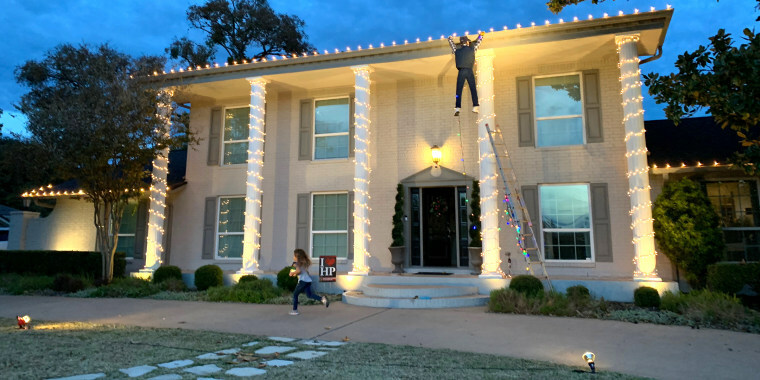 The owners of the house, Chris and Hannah Heerlein, had spent weeks decorating their home to reenact a famous scene from the movie, when Clark Griswold falls while trying to put up Christmas lights. In the hopes of winning their neighborhood Christmas decoration contest, they bought a life-sized dummy and picked out clothing from Goodwill that exactly matched Clark Griswold’s '80s outfit in the holiday favorite. Apparently it looked a little too real, because it wasn’t until after Norwood called 911 that he realized his mistake, and the police could see why he was fooled. “When the fire department got there and I explained to them what had happened, and they made an assessment of it, they said, ‘Yeah, I can see exactly what you mean,’” Norwood said. Meanwhile, Hannah Heerlein had been busy getting her kids ready for school, and she had no idea anything was wrong until a police officer knocked on her door and said that if her Christmas decorations ever caused this confusion again, she would have to take them down. At first she was mortified, but when she watched the security recording of Norwood trying to save the dummy, she also saw the humor in the whole misunderstanding. Afterward, she and her family reached out to Norwood to thank him for being a Good Samaritan, and gave him a gift card for his kind gesture. The Heerleins also hung out with Norwood and his grandchildren, and they shared a good laugh about the mishap. Soon after the incident, Heerlein put up a sign explaining that the “man” hanging from their roof was just a dummy. The incident has since gone viral, and Norwood says he’s surprised and a little bemused by the national media attention. “Apparently, you know, doing the right thing nowadays is something strange,” he said. Because for Norwood, it was only natural to jump into action when he saw a man in need.